Have you ever looked for a workout to do on a day that you felt like doing something different from previous workouts of the week? Look no further. A friend of mine published a book that includes biographies of 100 heroes in the military, special ops, police, and firefighting professions who paid the ultimate sacrifice defending us at home and abroad. Each biography has a dedicated workout for you to try in honor of that fallen warrior. 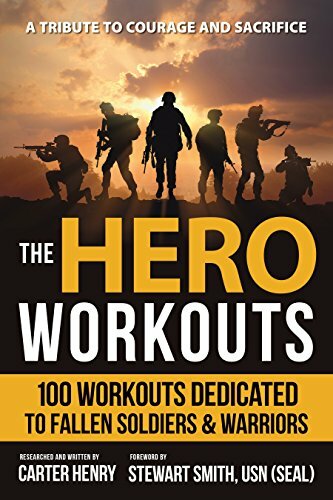 Check out the Hero Workouts – 100 Workouts Dedicated to Fall Soldiers and Warriors if you like fast paced CrossFit style workouts. Even if you do not like this type of training, you will have a hundred biographies about these warrior's lives to be remembered for eternity. Easily one of the most popular Hero Workouts is the Murph – named after LT Michael Murphy. This Memorial Day challenge workout consists of Run 1 mile 100 pullups 200 pushups 300 squats Run 1 mile *Get the repetitions anyway you can – (Max rep set, pyramids, or steady sub max supersets) Another favorite is "Daniel" named in honor of Sergeant First Class Daniel Crabtree – Army Special Forces. This is a book that will help you remember these brave heroes and perhaps make you work a little harder while you do something in honor of their life and sacrifice. Full Disclosure – I linked the author to my publisher, wrote the foreword, but make nothing off the sale of this book. In fact, the author of The Hero Workouts, Carter Henry (USN), donates all the profits to the Special Operations Warrior Foundation.